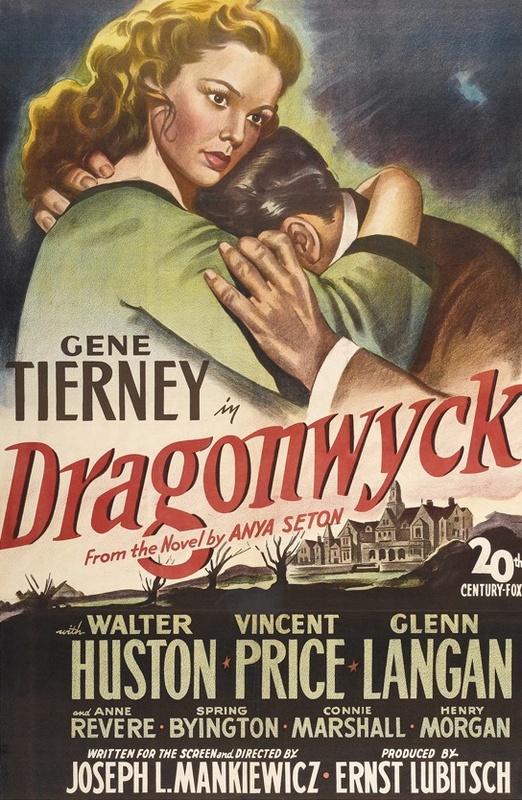 Director Joseph L. Mankiewicz’s Dragonwyck was adapted from Anya Seton’s best-selling 1944 historical novel of the same name. I haven’t read Seton’s novel, but I loved this film, and would like to dig into the book some day. Based on the description on the back cover, the introduction, and the first several pages that I leafed through, the film is a relatively faithful adaptation, as far as these things go. Neither Edgar Allan Poe nor Herman Melville make an appearance in the film, however, and the Astor Place massacre and steamboat racing both, sadly, fell outside the scope of the film. But that’s par for the course in any 100-minute long adaptation of a 350-page novel. Taken purely as a cinematic experience, Dragonwyck is an engrossing Gothic melodrama that treads lightly the tricky boundary between romance and horror. As a Vincent Price fan, I especially loved his performance in this film. In my review of Shock, which was released earlier the same year, I mentioned that it was the first role I’d seen Vincent Price play in which there was a glimmering of the horror icon he would become. Well, he continued to blossom in this role. While never descending into outright horror territory, Dragonwyck gave Price an opportunity to exhibit more range than any role I’d seen him play previously, and the way his character changes drives the film; from coldly aristocratic to warmly romantic, and from a wielder of petty power to a broken drug addict. The film begins in 1844. Miranda Wells (Gene Tierney) is a bright, beautiful young woman who longs to see the world. She lives on a small New England farm with her younger siblings, her mother Abigail (Anne Revere), and her deeply religious and strait-laced father Ephraim (Walter Huston). The Wellses receive a letter from their distant cousin, Nicholas Van Ryn (Price), who wishes to take Miranda away from her simple surroundings and employ her as a governess and companion to his young daughter at his home, Dragonwyck Manor, on the Hudson River. After much deliberation, Ephraim assents, even though Van Ryn’s wealth and atheism distress him. Like everything else in the film, Huston’s portrayal is fully realized. The character could have been portrayed as a two-dimensional Bible-thumper, but Huston crafts a believable and sympathetic character. Once Miranda arrives at Dragonwyck, the obvious touchstone is Jane Eyre, but instead of a madwoman locked in the attic, there is merely Van Ryn’s fussy, compulsively overeating wife Johanna (Vivienne Osborne). Theirs is clearly a loveless marriage, and as soon as we learn that Van Ryn is not really Miranda’s cousin by blood, we can read the handwriting on the wall. The story takes a lot of interesting turns, however, and I wasn’t ever quite sure what was going to happen next. While Van Ryn is portrayed sympathetically, he is also deeply flawed. A “patroon,” he forces his tenant farmers to pay tribute to him while he sits on a throne. It’s an anachronistic display of power, even for the mid-nineteenth century, and shows early in the film that all may not be well in Dragonwyck. Posted in 1946, April 1946 and tagged 20th Century-Fox, Alfred Newman, Anne Revere, Anya Seton, Arthur C. Miller, Betty Fairfax, Boyd Irwin, Connie Marshall, Darryl F. Zanuck, David Vallard, Dorothy Spencer, Douglas Wood, Dragonwyck, Drama, Edward B. Powell, Ernst Lubitsch, Francis Pierlot, Gene Tierney, Glenn Langan, Harry Morgan, Jamie Dana, Jane Nigh, Jessica Tandy, Joseph L. Mankiewicz, Keith Hitchcock, Maya Van Horn, Michael Garrison, Mickey Roth, Reinhold Schünzel, Ruth Ford, Scott Elliott, Spring Byington, Tom Fadden, Trudy Marshall, Vincent Price, Virginia Lee, Vivienne Osborne, Walter Baldwin, Walter Huston. Bookmark the permalink.